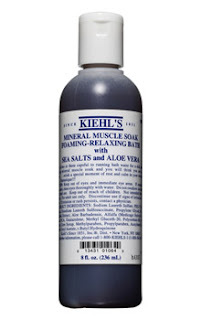 Obsession of the Day: Kiehl's Mineral Muscle Soak Foaming-Relaxing Bath | Fashion. Style. Beauty. | Life is short. Live well. After completing four hours of spinning this weekend and keeping a pretty vigorous exercise regimen lately, I admit it: I hurt. I have aches and pains in places that continue to surprise me. Still, I trudge on because honestly, all this exercise makes me feel amazing, even if my poor tired muscles might not always agree. My recent discovery? Kiehl’s makes this amazing Mineral Muscle Soak Foaming-Relaxing Bath ($19) that delivers like Domino’s when it comes to muscle aches and pains. Containing Sodium PCA, Aloe Vera and Calendula, it’s a bubble bath that helps draw pain out of the muscles, soothes and hydrates your skin and helps you rest more comfortably and the aroma is to DIE for. It’s a must for athletes, busy moms and those of us attempting to avoid the shame of turning our backs on your resolutions to get buff and hot this year. Nab some for your bath and I guarantee you’ll have something to look forward to after that next workout. This stuff is seriously amazing, especially for a sore Pilates core. Give it a shot!